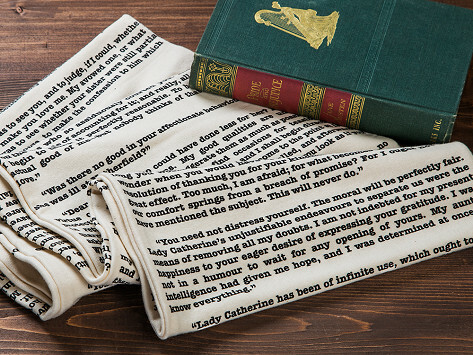 Wrap a book lover (maybe that’s you!) in a literary scarf bearing the words from a classic piece of literature. The infinity-style scarves are handcrafted in Oregon from soft cotton jersey with screen-printed text that’s heat-set to help prevent fading. From the yellow brick road to the Mad Hatter’s tea party, each scarf beautifully celebrates a book or poem. Dimensions: 63" diameter x 12"
Birthday present for a friend and well received! Good selection of books. Gave as a gift to my friend. It is very unique. She loved it. Maker Tori Tissell made her first literary scarf with a Pride and Prejudice theme as a gift. The scarf was such a hit, handcrafting them soon became Tori’s full-time job. Tori and her husband Chris created STORIARTS to celebrate some of literature’s most beloved works, like Anne of Green Gables, Jane Eyre, and The Wizard of Oz, by making them wearable. The infinity scarves are warm and soft—because, of course, a bookish scarf has to be cozy—and are made in Oregon. Tori handpicks her favorite part from each book or poem and pairs it with a thematic color, like black for The Raven. Text and illustrations are heat-set screen printed to prevent fading. At first glance, it might look like any type of print, but closer inspection reveals the words that make it so special. Each scarf gives back to literacy programs, making it an even more meaningful piece for book lovers.